When Patsy Reeve passed away in late 2013, it wasn’t just her family of four children and 11 grandchildren that felt bereft. The dozens of students she had worked with over the years at ASU West also felt the loss. The Reeve family, including clockwise from top let: Thomas, Katie, Ryan, Patrick and Tommy, are the creators of the Patsy Reeve Foundation and, launched last year, Camp Patrick—named after their youngest son (submitted photo). 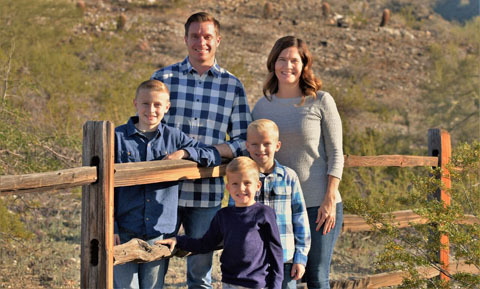 The Reeve family, who live in North Central Phoenix, wanted to do something in her memory, and launched the Pasty Reeve Foundation, to create scholarships for college students. “We want to keep our mom’s legacy moving forward and do what she loved doing … helping students and giving them a helping hand,” Katie Reeve said. But then the mission expanded after one of Patsy’s grandkids was born with Spina Bifida. His name is Patrick, and he was born only a month before Patsy passed away. “Patrick never got to know his nana, but we know our mom would be so happy her foundation is helping kids just like him,” Katie said. Tommy and Katie Reeve eventually launched a new nonprofit, called Camp Patrick, which provides a free weeklong camp for children with Spina Bifida. Camp Patrick is a safe space with wheelchair, walker, crutches/braces accessibility. “Our goal is to bring together families and provide kids who go to the camp an opportunity to not only grow up together but give them a chance to forget about their hurdles and just be a kid,” Katie explained. Camp Patrick, which opened in June 2018 and hosted 55 campers, is held at Whispering Hope Ranch, two hours north of Phoenix. The cost to attend camp is roughly $750 per camper, but this cost is waived thanks to donations from the Patsy Reeve Foundation. The camp is a 100-percent, volunteer-run program. Two events coming up in February and March will help raise funds for this year’s campers. First up is a “Touch A Truck” event set for 9 a.m.-2 p.m. Saturday, Feb. 9 at North Phoenix Baptist Church, 5757 N. Central Ave. Children and families will have the opportunity to explore and climb on fire trucks, helicopters, tractors, dump trucks, and military vehicles. There also will be bouncy houses, food, face painting, and booths from local businesses. Cost is $5 per person or $20 max per family. For tickets, go to: https://camp-patrick.ticketleap.com. On March 2, the Under the Stars with Camp Patrick Gala will be held at Papago Golf Club, 5595 E. Moreland St. The night will include a cocktail hour and silent auction followed by a plated dinner, program and live auction. Activities begin at 5:30 p.m. and tickets can be purchased online at https://bit.ly/2QyiLJi. To learn more about Camp Patrick, visit www.camppatrick.com.